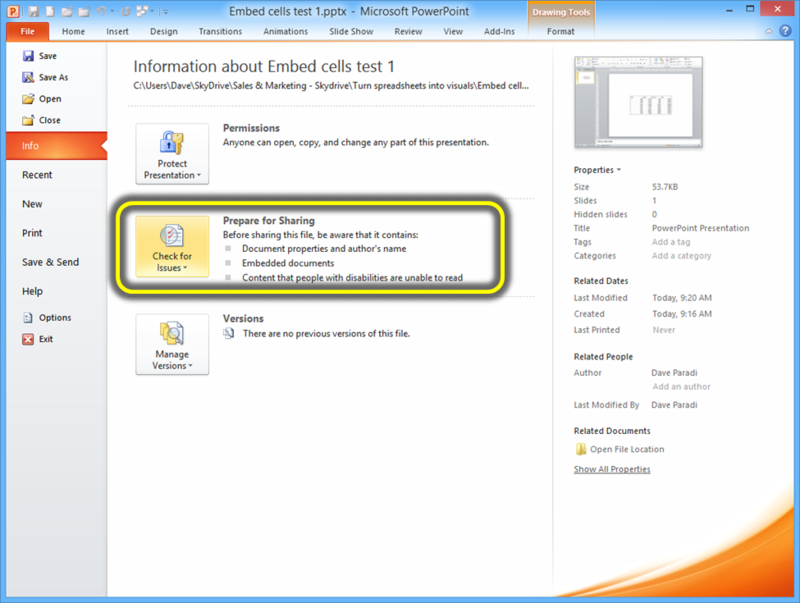 One of the big issues with copying cells or graphs from Excel into PowerPoint is that some of the common methods actually embed the Excel workbook into the PowerPoint file. This is a concern for two reasons. First, it makes your PowerPoint file larger, and second, it exposes all the data in the entire workbook, all cells on all tabs, to anyone who has the PowerPoint file. This means that confidential data could get exposed as a result (it has happened and been reported in the media). Exposing confidential data may cost you your job. The November and December 2014 updates to Office 2010 and 2013 have added a new feature that can warn you if an embedded Excel workbook exists in your PowerPoint file (Microsoft post about this update). PowerPoint has always had the Document Inspector, called Prepare for Sharing or Check for Issues on the Info section of the File ribbon. 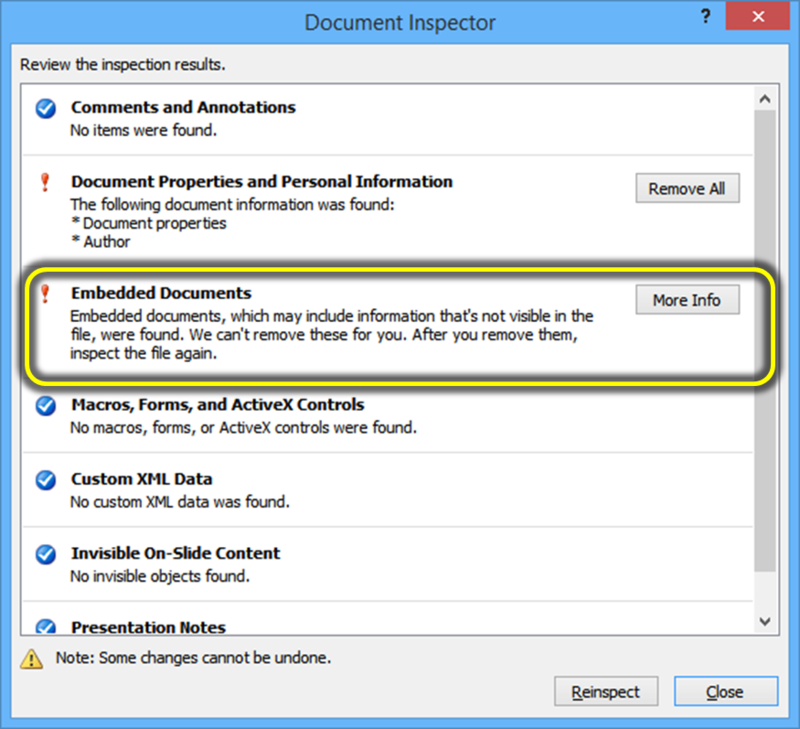 What was added in this update is the ability to check for embedded documents. 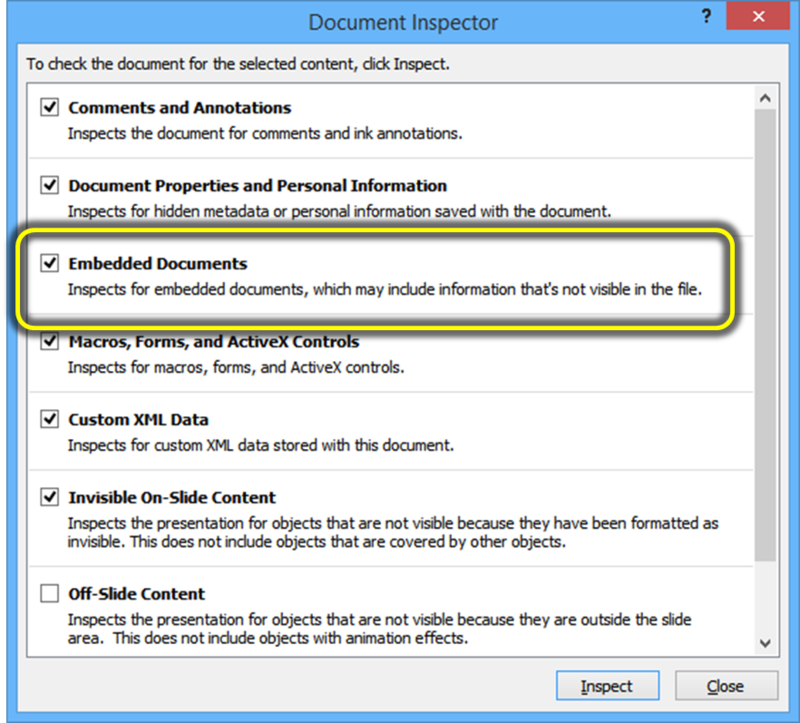 When you run the Inspector, make sure the checkbox is selected for Embedded Documents. If you do have an Excel workbook embedded in your PowerPoint file, you will see a warning about it. What should you do? Microsoft suggests that you change the embedded cells or graph into a picture by copying the object and pasting it as a picture. This is one option, but not your only option. This article explains four options for copying Excel cells into PowerPoint, this article explains two methods for copying Excel graphs into PowerPoint, and this article shows how to have a table in PowerPoint that automatically updates from the Excel file. If you want to know more about presenting Excel data, download my free e-book here. Remember to run the Document Inspector each time you send a PowerPoint file to others to make sure you haven’t inadvertently included data that should not be shared. A better approach when distributing the presentation widely is to save it as a PDF and send that file out since it will not contain the embedded Excel workbook.